Weather Station Vane Anemometer / Wind Direction Sensor | The Wonderful World of Microcontroller! 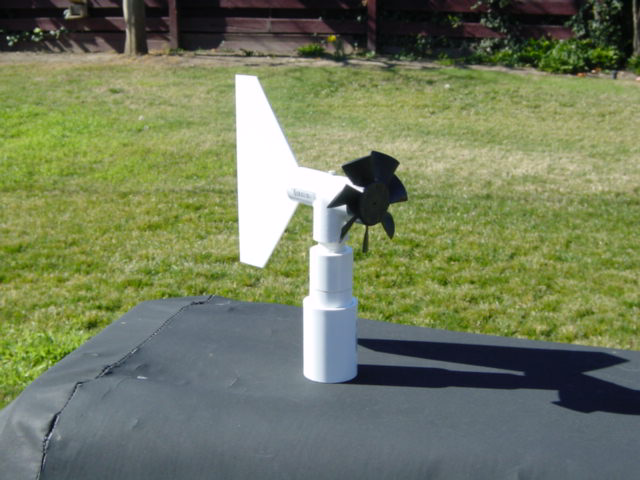 Finished building the Arduino / ATtiny wireless weather station Vane Anemometer, a type of anemometer which uses a small fan to measures wind speed and it also will measures the wind direction. Except for the tail and fan the sensor is completely built from PVC pipe fitting. The tail was cut out of the bottom of a plastic tray and the fan was salvaged from an old 5″ PC fan. The wind speed is counted by a reed switch activated by the old PC fan motor magnet, wind direction is sensed by a no stop 360 degree 10K potentiometer. This was quit a build the hardest part was the slip-rings to get the reed switch data past the wind vane bearings. Positioning the reed switch was also tricky the magnet in the old PC fan propeller runs complete around the inside diameter of the fan housing, if the reed switch is to close to the fan propeller it’s always on, not far enough from the fan propeller might get two click per revelation, and just far enough from the fan propeller will get one click per revolution took awhile to get this adjusted. The last issue, noticed that the fan would always rest in a certain place. Found that the metal wire in the reed switch was attracting the magnet, to solve this. Used a 12 gauge copper wire support within the fan housing then mounted the reed switch to the copper wire, this solved the magnet metal attraction issue.